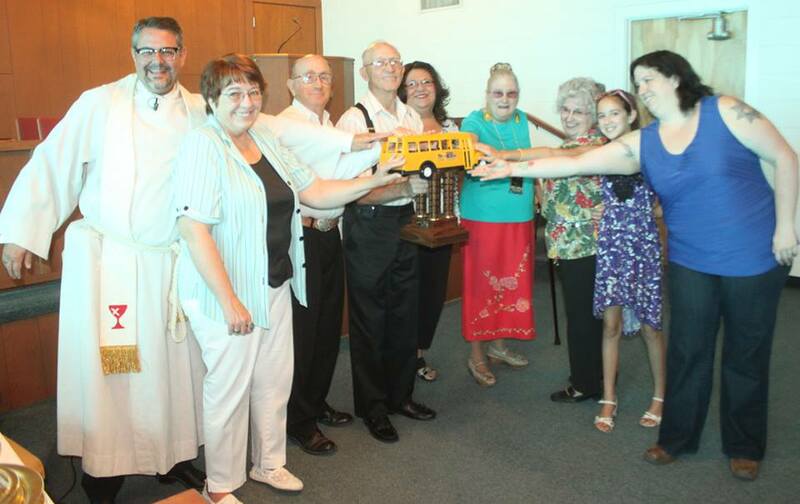 First Christian Church is awarded the coveted “Big Bus” trophy by the United Way of Carlsbad and South Eddy County for stuffing the bus. FCC raised more money and school supplies than any other organization in Carlsbad during the 2014 Stuff The Bus campaign. Pictured here are Preacher Dave, Janet Ellis, Marvin Lyon, Robert Lyon, United Way Director Linda Dodd, Gail Lloyd, Irma Pfeiffer, Rachel Rogers, and Erica Ellis. Olivia Quintana also participated, but was unavailable for the photo.